Fairbairns has been the main focus of Michaelmas for M1. From the beginning of term we knew we had a crew strong enough to challenge Caius to their third successive Fairbairns victory. King’s M1 has never won the Fairbairn Cup before, so we were all eager to change this and have our names recorded in KCBC history. The whole crew has been committed to the training that Chris Smith and I have set this term; pushing each other to the limit on the ergs and uniting as a crew on the water. As Fairbairns approached we knew Queens’ would be one of our closest rivals, while the speed and form of Caius remained elusive; as we had not directly raced them over the course of the term. Race day saw relatively fast stream conditions for the Cam, so I adjusted my racing lines appropriately to maximise speed from the river. We warmed up just as we had practised for the past three weeks, but heading into the unfamiliar waters upstream of the boathouse. As ten o’clock approached and the first crews headed off we de-kitted, passing everything we could to Chris Smith to hold in his duffle bag. Rowing down to the start the crew was silent, a mixture of nerves and excitement – we were all focused on the task in hand; the next 14 minutes of racing that would define our term’s efforts as a crew. I lined us up ready to start outside Goldie boathouse. The crew came forward to front-stops for our racing start. It was crucial that we got a good start; moving together and up at our top speed – we did. The first two minutes took us around the corners under the Elizabeth Way Bridge and saw us complete our start sequence. As we came past the King’s boathouse we sharpened up our catches and brought the boat speed back up to cruising. We were flying along in a smooth rhythm set up by stern pair, driven faster by the stream and aiming to pass through halfway as the quickest crew – Official results put us first at halfway, ahead of the lightweights by 1.7 seconds. Chesterton Footbridge marked the second phase of our race plan – from this point we would step on in an attempt to break all the other competition. We lifted out of the corner and surged past the P&E, focusing on the leg drive and connecting with the water. As we raced under the Railway Bridge we knew we had just over two kilometres to go – bridge to bridge, just as we had practised twenty times before. The crew was moving dynamically and fast, focusing on breaking Caius and winning from this point. We were approx. eight minutes into the race and tiredness was beginning to kick in, boat speed dropped slightly and the possibility of losing began to creep into our minds. As we rounded Ditton I knew we had to get back up to speed as we lifted out of it. I prepared the crew for the lift and surge. They responded. We flew along Plough Reach, thirty strokes of pure power to drive us into the corners and bring us closer to the finish. The boat was perfectly set on the entry to Grassy and stayed that way as we slingshot around it – maintaining boat speed and rhythm. First Post Corner marked the final stage of the race, this was our final chance to win it, if we so happened to be behind. I called a lift over three, getting the crew up onto their toes and allowing those with power left in their legs to drive the boat on. The intensity from everyone was outstanding as we raced along at 35 strokes per minutes, the bows lifting out of the water each stroke and propelling us forward. I may have shouted the famous Gladiator quote, ‘What we do in life echoes in eternity’, over the cox box at this point to help maintain focus – we were going to do it. Nearing the Motorway Bridge I called for a final lift and the response was incredible. Just when I thought the guys could give no more, they took the rate up to 36½ and the speed jumped up another notch. This was it. The final surge for the line; lactate in the legs burning, lungs gasping for air, and faces grimacing. As the crew slumped over their oars it was clear that none of us could have done any more to obtain victory in that race. Faces were marred by sweat and pain. Eight weeks of training focused on one race, a chance for King’s to take a step forward on the river and beat the best rowing colleges; to grace a place on the Cam where no King’s crew had gone before – the Head of the River. We have won Fairbairns – technically a joint victory with Queens’ M1 who were within one second (slower) of our time. I would personally like to thank every member of the crew and Chris Smith for being extremely committed to the boat club this term and making this victory possible. We have made history guys! With the two boat rule in action and several yellow flags in the weeks leading up to the race, as well as two last minute subs, M2 weren’t best prepared for the 4.4km Fairbairns course. In the true spirit of King’s we went out to do our best anyway! After working our way through the chaotic marshalling pattern we lined up ready for the start. Having not quite perfected our standing starts we set off from rolling; winding up over seven and lengthening over three. Despite having a scratch crew we managed to settle onto a good rhythm, with the boat moving well up at a high stroke rate. As we came past King’s boathouse everyone seemed to sit up tall, allowing the boat to fly along centre stream. Legs were going down fast and strong, driving the boat along at a respectable speed to last out the race. As we rounded Chesterton, with the entire length of the Reach in front of us, tiredness began to take its toll. Lifting out of the corner we lost the strong rhythm we had before, such that the boat felt heavier with each stroke. Everyone was still putting in the effort, but crucially not together. Surging down the Reach we managed to keep our composure, setting up a level platform to attack to corners from. Coming out of First Post Corner we pushed on towards the line; taking the rate up a couple of pips and driving the boat speed up. Emptying the tanks we drove on from the Motorway Bridge with less than twenty strokes left. Crossing the line we were spent. Thanks to all the M2 guys for the work they have put in over the term, let’s keep it up and push on toward Lents. Fairbairns is arguably the most eagerly anticipated and most dreaded race of the Michaelmas term; it promises a great turn out from all the clubs and a chance to measure up crews against one another yet at the same time it is the longest race of the rowing calendar. Fired by the good performance at Bedford the crew entered into Fairbairns with a positive frame of mind. The row was solid and we managed to maintain a nice rhythm throughout the piece. The fitness that the crew had been developing throughout the term seemed to have paid off, as the overall feel of the row was solid from start to finish. 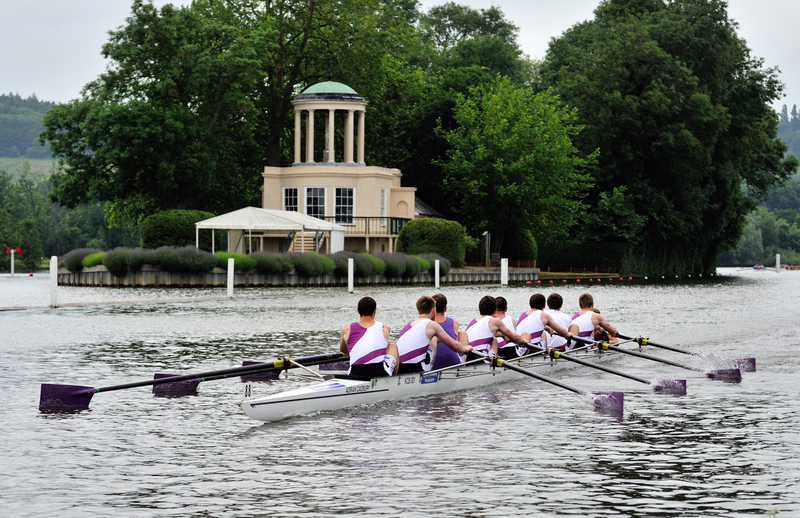 Although the end result saw King’s 1 second off their Murray Edwards rivals, our time still beat some of the most respected crews on the river and the overall result was top five among the college boats which was more than satisfying. Paul Thomas (2005) – obviously Paul is still here, but he is old enough. Chris Perry (2010) – owing to being old and senile and the fact that I only see people if they row; I erroneously thought Chris had graduated. We arrived at precisely the time we meant to, which ranged from about 9-9:15 depending on traffic or whether Elliot’s borrowed bike worked. Having relaxed M1 with our old school chat and setting them up for their famous win, we busied ourselves with misadjusting our boat so that we had something to blame for a poor performance later on. After boating we had a brief warm up where we realised that we could balance the boat fairly well, and Andy had an opportunity to run through a variety of coxing accents (cockney, overly posh, South African and John Anderson from Gladiators) before settling on his own accent for the race. Marshalling went as well as could be expected, it would have gone better had we been left to our own wise devices, but sadly it seemed the organisers wanted to demonstrate that we paid the entry fee for something and tried to interject a couple of times. Eventually it came time to reduce our layers and start the race. The start went well, hitting the high 30s after only a couple of strokes, and we settled down well, allowing us to concentrate on the first of our race plan goals; looking good on the photos. This seemed to go fairly well and we kept up a decent pace to King’s boathouse, where the watching crowd cheered us past with a mixture of sympathy and surprise (alumni rowing is like a talking dog, it is not how well it is done, but more that it is done at all….). Safely out of the sight of people watching we turned our attention to a solid rhythm of 30.5 spm and the second of our race goals, getting to Chesterton without screwing up anyone else’s race by being too slow. Having achieved this we moved onto the tactical master plan that we had been working on all morning. Basically it had occurred to us that going fast on the way down stream was all well and good, but as we would still be waiting for the last boat to finish, it wouldn’t help us get to the pub any earlier. Hence we decided the best course of action would be to save ourselves a little for the row home. This plan also had the benefit of protecting the more aged of us from arthritic flare ups and so on. Up until the end of the reach the plan was working very well. Unfortunately at this point, Boars Head (Queen’s Alumni) who had started behind us began to gain alarmingly fast. This was probably due to the rather unsporting tactic of having done some training, so we weren’t about to let them come by and spoil our theory that training wasn’t actually necessary. From Ditton to First Post, this played out like the end of an unsuccessful bumps race, and on First Post we were forced to move out wide in a cunning feint to allow Boar’s Head to try and overtake. Then we showed them the true meaning of racing. Anyone can go fast if they have done some training and aren’t under pressure, it’s when the chips are down that it really counts, and looking at some of the waistlines in our crew we knew a thing or two about the chips being down. Pushing hard out of the corner, the race became more like a side by side regatta, with a sudden spurt taking us back out to a length. Boars Head tried valiantly, using all of their fitness and training, to get back but only managed to cut our lead (won by sheer bloody mindedness) to half a length by the line. Having finished to the cheers of M1, who were presumably hiding their horror that in 5 years they will be like us, we gave three cheers to Boar’s Head and received 3 in return as though in fact only the last 500m of the race had actually mattered and they hadn’t handed us a 35 second spanking. After this we did a couple of high rate burst on the way home using the energy conserved from the race, and thankfully for all arrived at the pub in good time. In my case I went via watching M2, who whilst failing to match our speed, did show admirable alumnus potential by breaking a seat a couple of times to give themselves a good excuse. All in all a good time was had by all, and judging by the comments I have had back since, it may even become a yearly fixture. Novice M1 had the pleasure of going off at the head of the women’s division (due to all three crews sharing the same boat). This should have meant easy marshaling and a clear race. Unfortunately, the women’s crews behind pushed our marshaling position right up to the start. Some powerful backing down from stern four quickly corrected this in time for the start, and the crew was underway. They wound well and settled comfortably onto 32 strokes per minute. This was a rate which they had seldom reached before, so we were surprised to see them hold it for most of the course. The race was not without mishap however; there was an unfortunate period mid race where they were down to seven men due to seat issues. Nonetheless, they wound back up afterwards and despite technique starting to slip as they got tired, they managed to finish strongly. It’s a strange day when the cox is taller than all of the crew, but it came about all the same. Due to last minute coxing issues, Paddy, who is more regularly found at six in M1, was kind enough to step up and volunteer to cox a Fairbairns novice crew, still officially qualifying as a novice cox himself. Marshaling would have been tricky due to the extremely fast stream and disorganised marshals were it not for Paddy commandeering Phil’s blade for some sideways rowing. Eventually the race was underway and the crew wound up well, with Phil setting a fast but steady rhythm. Despite his inexperience, Paddy took some good lines to get the boat safely around the corners and the crew responded well to lifts. The crew finished in a decent time, rounding off their novice term proudly. Nerves were running high because Novice M3 were to be the first King’s crew of the day to race the course. Marshaling went by in a blur of tapping and shouting, but being the first division there was not too much of a delay before the crew got moving up to the start. The wind wasn’t their best, but Brioni managed to lift them up on to a good race pace, and the boat was moving well for the first half of the race. Unfortunately as tiredness began to set in there were a few mistakes which resulted in some early morning crustacean fishing. The crew didn’t recover from this quite as well as we might have hoped, but they certainly didn’t slack on the effort, and pushed through all the way to the finish to bring King’s home safely. The final race of term was Fairbairns, for which we entered both our novice boats. Our Novice W1 boat started off well and kept it solid at a decent rate the entire way. No crabs gave us an excellent race which impressed everyone who saw it. They came 11th, an incredible achievement for King’s rowers. 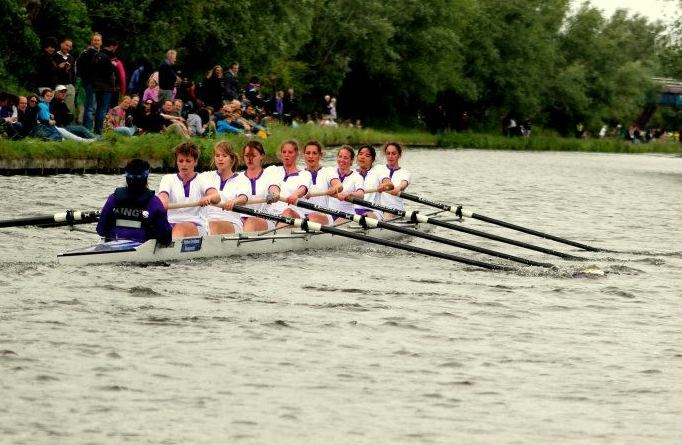 As far as the archives went no King’s novice women’s boat had ever achieved above 27th before! Our Novice W2 boat had a slightly different story, a sucession of crabs resulting in an involuntary park at King’s boat house mid-race… Still, they got to the end and only came 42nd, which showed that mistakes aside, their rowing was actually not too bad. We put together a mixed bunch – most of them had not rowed together before so we were expecting an interesting race. We started off well, winning the first race against Trinity Hall easily. We were then pitted against Pembroke whose women looked rather beasty, and though our dainty novices put up an impressive fight, they didn’t quite make it. On the whole, Emma Sprints is supposed to be a mixture of crabbing and other such delights. Dressed as the Fellowship of the Ring with Gandalf steering at the helm, the girls pulled away quickly in their first race. An impressive irretrievable crab from our bow made it seem as though we were out of the race but incredibly they continued to pull away achieving a victory by at least two lengths! Our final race was against Selwyn Nov 1. We were side by side most of the way, with Kings about half a boat length ahead, and it looked as though we would win the tournament easily. However, in the last 10 strokes, we were robbed of our victory and our well-deserved prize due to an unfortunate collision… An unlucky end to a fantastic days rowing, which really showed how good our girls were compared to other novices on the river. For many of the crew this was their first ever off-cam race (previous attempts having been foiled by bad weather conditions and crew complications). So it was with an air of great excitement that the nine set off for a day at Bedford. An early division meant an early and frosty start to the day but everyone arrived safely and in plenty of time of assemble the boat. At Bedford, the weather cleared to cool sunshine and the friendly, buzzing atmosphere of the venue meant that the girls approached the race with feelings of anticipation and excitement. The unfamiliar course encouraged everyone into serious focus and so the coxing and rowing was of an excellent level throughout. After a solid warm up, the resulting confidence saw the crew to the finish line with a personal best time. Unfortunately, the feeling among everyone might have been slightly too jubilant as not enough concentration was paid in spinning with the result that the Jolly Roger spent a happy ten minutes wedged between the two banks while marshals attempted to shoehorn the boat out of the gap and so remove the blockage. All in all, the day proved to be relaxed and happy with and this no doubt contributed to the best result the crew has seen to date. We look forward to our next crack at the Bedford course in February. 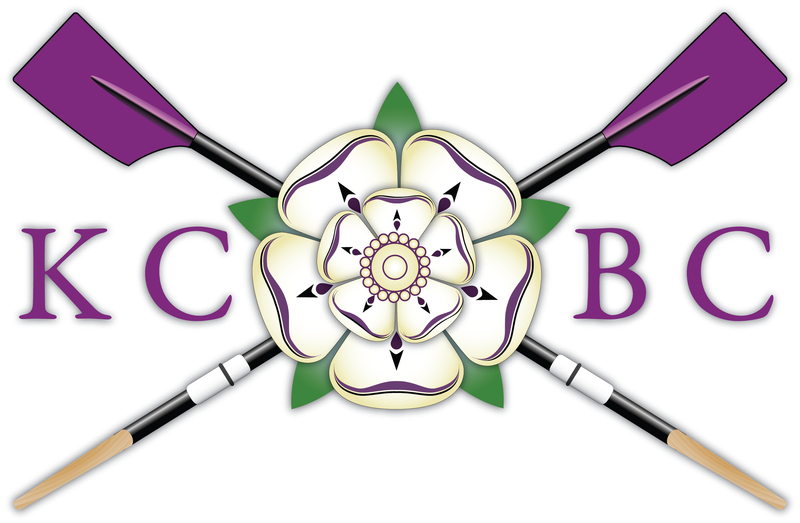 W1: [Bow] Naomi Fenwick,  Vera Konieczny,  Brioni Aston,  Alex Hayes,  Beth Wratislaw,  Liz Dzeng,  Matilda Greig, [Stroke] Marijne Mak, [Cox] Nicole Samuel, [Coach] Roger Thorogood, [Boat] Jolly Roger. After our successes in Uni IVs we were determined to transfer our speed, rhythm and control to the eight. Due to injury, Chris Smith, our coach, subbed into the seven seat for the race; allowing us to compare ourselves to the other colleges, but race for time only. We set off behind two off-Cam crews, who we were determined to chase down as their coxes attempted to get round the Cam’s tight corners! Our start was good; hitting forty strokes per minute and driving the boat speed up. Along First Post Reach we dropped down to our race rhythm a little too early, resulting in a slightly heavy feeling to our rowing. Nevertheless we were still moving rapidly and took the corners well, closing on the Imperial crew in front. On the Reach we faced the rough conditions of Imperial’s wash as they swerved across the river, blocking any clear water. We held our rowing together, pushing on from the Railway Bridge, and surging toward the finish line. We hadn’t rowed badly, but we all agreed on several ways in which we could improve before Fairbairns. We had only been rowing as a second eight for two weeks when Winter Head arrived, however the experience of our stern pair had helped us find a good crew rhythm during training. Our starts still needed some attention, but we were all excited about our first race of the year. Off the start we were absolutely flying; comfortably up at rate 36, getting the blades in right at the front and squeezing the boat forward. Unfortunately as we came into First Post Corner a crab knocked us off our rhythm and we never found the same speed we had before. On the Reach we kept the intensity as tiredness started to show; there was no point where our rowing fell to pieces. We held our own all the way to the finish line. It was a promising display from the second boat as we now focus on Fairbairns. Winter Head was the first opportunity for the novice men to experience a real race, and also get a taste for how far they would be expected to row in Fairbairns. The crews were unfortunately placed near the bottom of their divisions as timing restrictions meant they had to enter the senior-heavy morning divisions. However, they did their best to fend off the cold during marshaling and were underway eventually. Both crews were unlucky enough to suffer from both crabs and seats coming off, so the results weren’t awe-inspiring. However, they definitely benefited from the high rate experience and practice in a race. Queens’ Ergs is always a nervous time for novices and this year was no different. With a few last minute subs some of the crew hadn’t even had a chance to practice the 500m piece. Nevertheless, they went in and all did their best. There were a few impressive scores, but unfortunately the crew couldn’t do enough to make it into the final. They had however gained valuable experience in how to cope with nerves before a race, which will set them up well for Winter Head in a few weeks. The girls began to shine at their first event, Queen’s ergs. Indeed, it is not the most appetising event, with around 16 crews standing in a room, screaming at novices while they kill themselves on stationary machines while spectators jeer. At the end, with all eight girls having finished their 500m sprints, we realised to our surprise that there were still many crews still going. After a long wait, the results revealed that we had come third in our division; a fantastic achievement and great way to start our novice term. Finals Friday presented us with the possibility of rowing twice in the afternoon; the re-row of the previous day had us prepped and ready for this eventuality! We got off to an impressive start from our downstream station; our rowing felt smooth and comfortable as we tour along First Post Reach. Within ten strokes we were noticeably gaining on Christ’s who could see us catching them, but never really responded to the threat. We lifted out of Grassy onto a powerful rhythm that lifted the bows out of the water and had us flying along. After three tight lines around the corners (much improved on the previous day) and a brilliant response to lifts, Christ’s were beaten. We had found an awesome rhythm and boat speed that could potentially win us the competition if we could recreate it in the final. 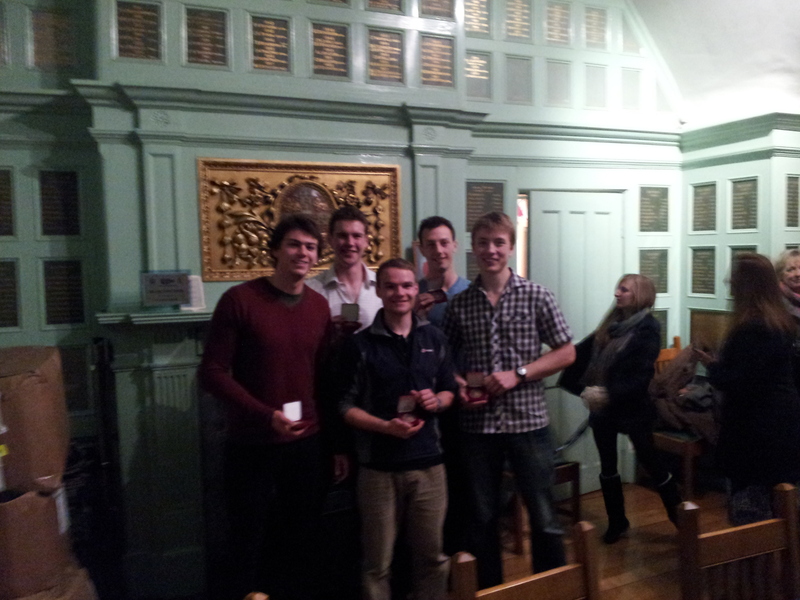 In the final we were facing Caius M1, who knocked us out in last year’s semis. Again we were on the downstream station, determination consumed us – King’s had not won Uni IVs for several years, this was our chance. After a great start we were up on our rhythm, allowing the boat to flow under us, really attacking the course into the first corner. Caius had taken an early lead, but the crew was not aware of this – we still had the belief. After two extremely tight lines around First Post and Grassy, we took the boat speed up a notch and started to make our move on Caius. In front of the Plough they were approx. a length ahead – only a couple of precious seconds to get back. As we rounded Ditton, Will could see Caius splashing about in the headwind – we gritted our teeth, sat up tall and held our form in the wind. As we stormed up the Reach we drew back on station and pushed on through to a powerful finish. It took several tantalising minutes for the official result to be announced, but finally it came – we had won by three seconds. Having been lucky in the draw and securing a bye through the first round, we lined up for the quarter final feeling fresh and ready to race. We were starting from the upstream station, meaning we would be able to see how far ahead we were throughout the race. We got off to a good start, hitting one of the best rhythms we had managed in our short time as a four. It quickly became apparent that LMBC were not going to keep up with our pace, but we held our rate and pushed them away through the corners just in case they put in a sudden burst! Once we got onto the Long Reach we were sure they were not going to catch us, so Ben settled us into a slightly more relaxed rhythm to hold through to the finish. Despite this drop in intensity we still set the fastest time of the second division, covering the course in 7 minutes 51 seconds. Following our success on the Thursday, we knew we would have to pull out two equal, if not better, performances on Friday if we were to win the competition. This time we were starting on the downstream station, so we had to rely on Ben’s feedback to know how we were doing against Downing. The rhythm we hit off the start was good, but perhaps not quite our best, so we pushed hard when Ben called for it. When he told us we were gaining, this only served to make us push even harder. Despite the Long Reach being rough with a strong head wind, we held our lead to the finish to secure our place in the final. We had made it to the final. We knew Queens’ M2 were fast, so when we lined up on the upstream station nerves were on edge. Queens’ started well, but had we. Straight into our fast, strong, and controlled rhythm – with the boats on station the corners would test both coxes to bring their crew out ahead. By the time we were passing the Plough, we looked to be slightly in front of Queens’. However, as we came onto the Reach we were hit by a stronger headwind than we expected. Despite our best efforts to hold off Queens’, we could see them gaining – they were coping with the headwind better. Ben did all he could to lift us up and we appeared to stop Queens’ gaining, but it was too little too late. No number of power tens could recover the lost ground. We had a demoralizing moment of realisation when we saw their finish marshal lower his arm before we had crossed the line. The crew was understandably very disappointed, but we were proud of our achievement. We had still made it to the final and given it our all.